A picture is worth a thousand words – and this little hybrid is no exception ! 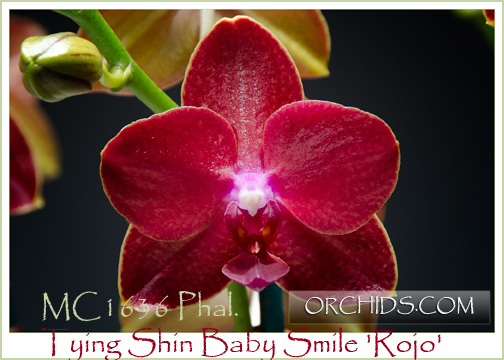 From the breeding program of the famed Tying Shin Orchid Nursery in Taiwan, this multi-floral miniature hybrid population garnered 7 AOS flower quality awards in addition to an Award of Quality at two recent Taiwan International Orchid Shows – and this clone just received its AM/AOS for our client, Mr. Carlos Fighetti. Long lasting brilliantly waxy red tone flowers are produced on compact branching spikes, leaving just a narrow yellow picotee around all its segments, its red almost totally covering the entire flower. 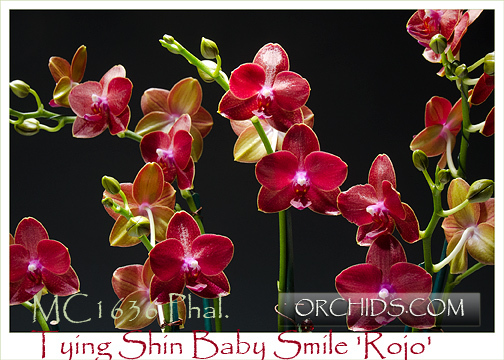 Beautifully accented with a fluorescent red and pink lip, this is a must-have for every serious Phal collection. Very Highly Recommended !